Despite October’s industrial action and ensuing PR disaster, Qantas business customers still remain the most satisfied. But maybe not for long, according to Roy Morgan Research’s latest report. 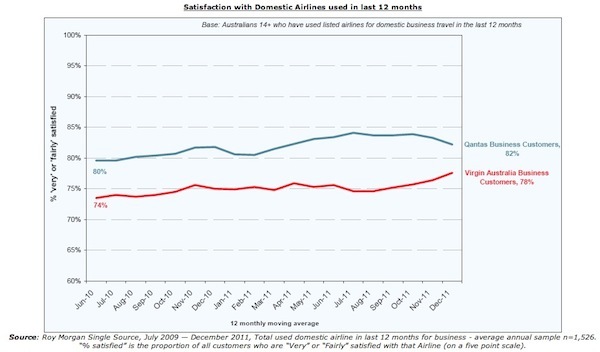 Satisfaction among Qantas business customers has fallen 2% since industrial disputes which caused major disruptions for 100,000 Australian air travellers, down from a high of 84% in October 2011 to 82% in December. In contrast, Virgin Australia’s business customers displayed a slight improvement in satisfaction over the same period, increasing from 76% to 78%. However, business satisfaction with Virgin remains lower than the airline’s overall satisfaction which sat at 82% in the quarter to November. The findings, from Roy Morgan Research’s ‘Airline Customer Satisfaction Report‘, come a week after the launch of Virgin’s domestic business service which the airline hopes will double its share of the corporate market by the end of 2012.
International director of tourism, travel and leisure at Roy Morgan Research, Jane Ianniello, predicts that Virgin will close the gap further on Qantas in the coming months. “The [business] satisfaction rating for Virgin Australia, with its quick response in putting on more flights during the Qantas industrial dispute has increased strongly in the past two months,” Ianniello says. For airline industry expert, Carolyn Childs, the data is inconclusive and may simply represent a passing irritation with the disruptions cause by the industrial action. Childs, director of MyTravelResearch.com, believes that despite changes to professionalise the Virgin brand, they still have a long way to go, particularly at the top end of town. “If I was Alan Joyce, I wouldn’t be hitting the panic button just yet. There appears to be a lot of emotion still invested in the Qantas brand among business travellers,” Childs says. “The key to unlocking the business segment will be understanding the who of the business market as it changes from predominantly middle-aged men to a younger and more diverse group. “An awful lot of business travel is now linked to the resources boom, travellers who were not historically business travellers. Qantas however appears to be making moves to appeal to a more diverse audience, having appointed Miranda Kerr as a new ambassador for the airline and beginning trials of a streamed entertainment service for customers to view on BYO devices. On Monday, Fair Work Australia put an end to further industrial action against Qantas for at least three years, endorsing the agreement put forward by the airline and the Australian Licensed Aircraft Engineers Association. Homepage image courtesy of Damon Garrett, via Flickr.